Recording your real estate documents online through the RecordingPRO eRecording solution allows you to skip the inconvenience of physically transporting your documents to the Register. Your documents will also be processed much more quickly and you will not have to worry about anything getting lost in the mail. We use industry-standard technologies to process and secure all information going through our system. Additionally, we do not store any sensitive payment information on our servers. As such, our software works securely, reliably, and cost-effectively. To sign up, please click the red "Signup Today" link on the left of the page. Follow the prompts thereafter. Once you have created your account, an email will be sent to the email on file to validate your account. After you submit the MOU, an Inttek employee will review your MOU. Once it is accepted, you will receive an email, and you can begin recording! How do I record documents? After signing up and logging in, you may create "county accounts" for selected counties. 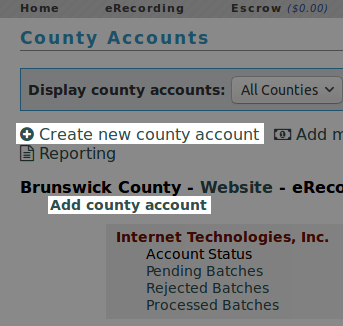 Once you have created a county account, you may create a new batch by clicking on that county's "New Batch" link. A batch is simply a group of documents that you wish to submit to the county register. You can then select your scanned document (must be a PDF file), and may also opt to have the system automatically add the eRecording disclaimer for you, if that was not done already. On the following page, you may also rotate the pages of the document. Once you have entered all the instruments that you wish to submit, click "Pay for and submit this batch." At this point, you will be able to pay to submit the batch with a credit card, PayPal account, or escrow credit (if you have any). Once you have paid, you will be able to submit the batch to the register's office. The register will be informed of your batch arriving, and will review it. If they notice a problem, the batch will be rejected, and your moneys will be refunded to you in the form of escrow credit. You will be informed by email about any rejections, which will explain the reason for rejection. Why are there county accounts/sub-accounts? RecordingPRO® eRecording allows you to create multiple sub-accounts (referred to as a "county account") underneath the main account associated with your username. In order to record, all users must create at least one county account associated with the county in which they wish to record. If your business has more than one office, or more than one person in the office that may be recording documents for the same county, and wishes to share one login for the entire operation, simply create a county account for each office/lawyer/paralegal that may need to record at the same time. This will help keep batches of associated documents separate from one another; which simplifies the submission process and ensures that documents are sent in a timely manner. From there, you will select the county you wish to make the account for, and change names and addresses as necessary. Credit card and PayPal payments go through immediately; however, to cover processing fees we charge a fee equal to 5% of the total recording cost (including revenue stamps). ACH transfers take a few days to go through, but the fee for using ACH is 1% of the total recording cost. There is no fee levied on free documents (e.g. satisfactions). If the register's office rejects your batch, we refund the amount it would have cost to record the batch by going to the register's office, in the form of escrow. The user may resubmit their batch using the escrow credit, for which there is no additional convenience fee. For instance, a $26 document would cost $26.78 (the instrument cost plus 3% convenience fee) to record using a credit card or PayPal. If the document was rejected, the user would be refunded $26.00 in escrow. The user may now resubmit their $26 document using the refunded money without having to pay any convenience fee. If you wish to receive any amount of your escrow funds as a check, please contact us using the contact form. What are the NC Recording Standards? Have a 3 inch blank margin at top of first page and ½ inch blank margin on remaining sides of first page and on all sides of subsequent pages. Black type on white paper. Only one-sided typed or printed text. Type of instrument at top of first page below blank margin. If an instrument does not meet requirement outlined above, the Register of Deeds shall register the instrument after collection a $25.00 fee for non-standard documents as required by NCGS §161-10(a)(18a) . If an instrument fails to meet the requirement of font size (less than 10 points), but is determined by the Registrar that the instrument is legible, the Register of Deeds may record without collecting the non-standard fee charge. What is the NC electronic recording notice? Submitted electronically by ______ (submitter's name) in compliance with North Carolina statutes governing recordable documents and the terms of the submitter agreement with the ______ (insert county name) County Register of Deeds. If this notice is not present on your submitted file(s), you may check the "Add eRecording Disclaimer to Document" checkbox when adding a document to have our system automatically insert it. Are there any other notices I may need? The Register of Deeds may not accept any deed transferring real property for registration, unless the county tax collector has certified that no delinquent ad valorem taxes, fees, assessments, or other liens with which the collector is charged are a lien on the property described in the deed. This instrument prepared by:____________, a licensed North Carolina attorney. Delinquent taxes, if any, to be paid by the closing attorney to the county tax collector upon disbursement of closing proceeds. Founded in 1996, Internet Technologies, Inc. (Inttek) is a privately held company that focuses on the development of e-business and e-government solutions, as well as the delivery of wireless communication solutions. Inttek’s wireless solutions include broadband internet access, mobile network access and wireless data collection. Today Inttek continues its commitment to providing advanced web-based application software — and the expansion of its Southeast North Carolina and wireless broad band services. RecordingPRO® is Inttek's fully-featured Register of Deeds solution, including in-house point-of-sale and indexing software, a fast and flexible record searching interface, and an eRecording portal.